For a template resolution based off the ones passed in other I-14 Communities click here. This is a great start to passing A resolution in your community! On October 24th, 2017 Columbus, GA becomes the first city along the route to create a resolution advocating for the support of I-14. Thank you Mayor Tomlinson and the rest of city council. Encourage your local communities to endorse I-14 as Columbus did! 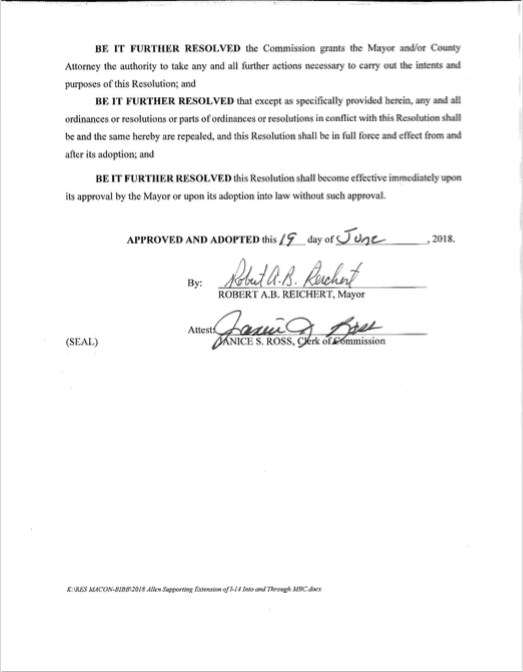 On June 13th 2018, The Russell County Commissioners became the first in the state of Alabama to pass a resolution advocating for I-14. A special thanks to all of the Comissioners, especially Chairwoman Martin, for their immense support in our efforts. 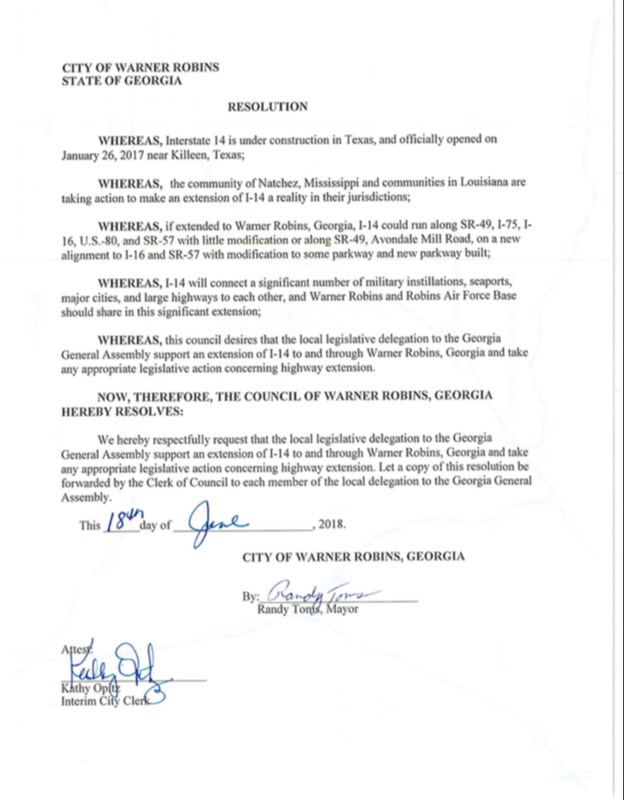 On June 18th 2018, Warner Robins, GA passed a resolution in support of I-14. Thank you to Mayor Toms and the rest of the city council for passing the resolution. We are hopeful to see how I-14 will bring more economic opportunities to the region and further connect Robins AFB to the grid. 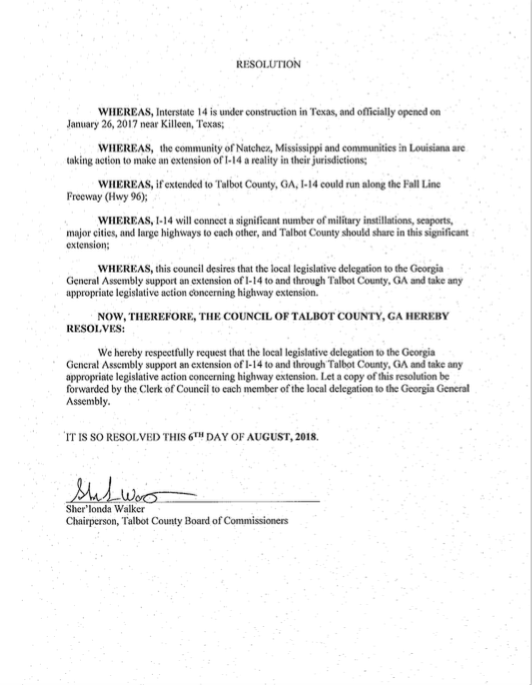 On August 6th, 2018 Talbot County, GA passed a resolution advocating for the extension of I-14 through their region. Thank you chairwoman Walker and the rest of the commission. We look for to enhanced connectivity to this awesome community. On June 19, 2018 Macon, Georgia joins those communities advocating for Interstate 14. On August 14, 2018 Butler, Georgia passed a resolution advocating for the expansion of I-14. Phenix City, Alabama passes a resolution to push for I-14 to be built through their community. This marks the first city in Alabama to push for I-14. On the 13th day of September 2018, Washington County, GA passes a resolution to support the extension of I-14. 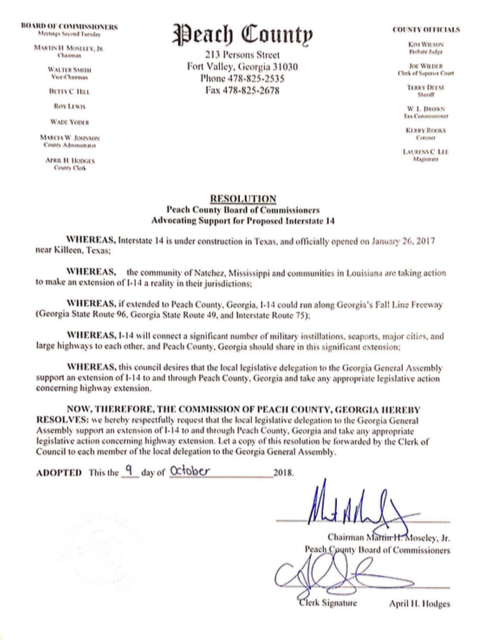 On the 9th day of October 2018, Peach County, GA passes a resolution advocating support for I-14. On the 25th day of September 2018, Milledgeville, GA passes a resolution of support for I-14 to extend along the Fall Line Freeway through Milledgeville and Baldwin County.